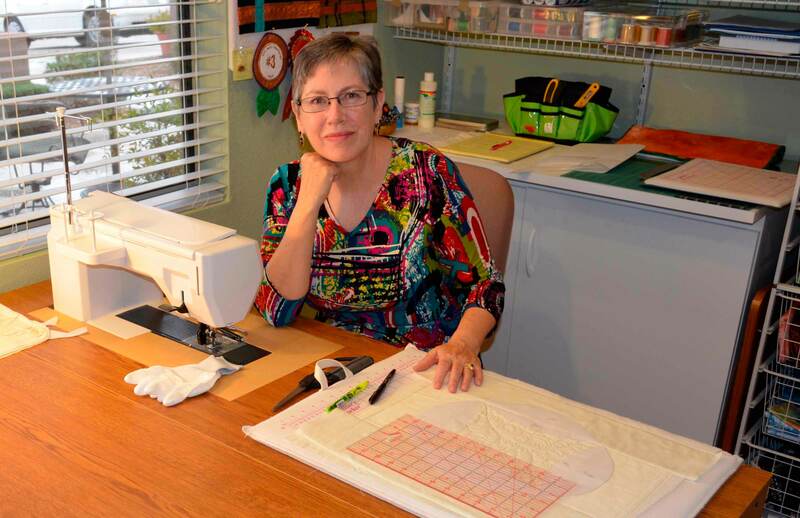 Alicia Sterna is one of many in Arizona today who are transforming quilting with bold, creative strokes. Largely self-taught, and the only member of her family to take up quilting, her recent work has been featured in a touring exhibition of winning quilts from the Hoffman Fabric Challenge Competition, as well as the upcoming “100 Years, 100 Quilts” exhibit which opens February 18, 2012 at Tucson’s Arizona History Museum (949 E. 2nd Street). 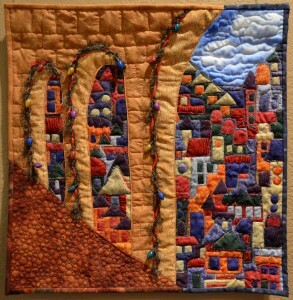 For the latter show, quilters of all levels were requested to create quilts that depicted some aspect of Arizona for a massive exhibit. Sterna was chosen from the 100 quilts participants to be one of 13 quilters to interviewed for 5-minute portraits, to be showcased each month of the Arizona Centennial year on the website of the Arizona Historical Society. What got her into that sub-set was the story behind her quilt for the show, “News.” The quilt is about the ways people received their news when Arizona was a fledgling state and how they get it now, newspapers being an important source at the beginning and a lesser force today. So how do you create the look of newspaper fronts in fabric? Sterna used tea bags, steeping the tea, cutting the bags open, dumping out the tea, drying and ironing them. With her husband, Randy’s help, she reverse printed the type faces of the Arizona newspapers she had researched and tore them to give an uncut look to the “newspapers” on the quilt. 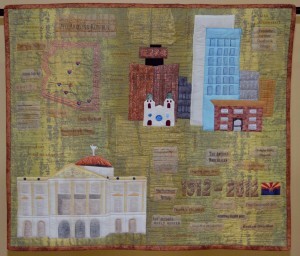 She used tea again to stain the fabric she’d use to depict the state capitol building. You can hear her tell the story in a 30-minute documentary on the show by film maker Daniel Buckley which will be played daily at the show, and which will be on sale at the museum gift shop and PayPal through the Arizona Historical Society website. Sterna grew up in Tenafly, New Jersey and moved to Arizona in 1970. She had been accepted to Kent State, but following the May 4, 1970 shooting of protesters there, her parents decided she should go somewhere else. When she left for a summer vacation in the south of France with her aunt – an art curator with New York’s Museum of Modern Art – that summer she had no idea where she’d be going to college in the fall. When she got back, she heard she’d been accepted at the University of Arizona, and was leaving for Tucson the next day. She eventually earned a law degree at UA and moved to Phoenix to work for the Arizona Department of Public Safety, where she met her husband, Randy, now a retired deputy director of the department. Randy Sterna is an accomplished digital photographer whose shutter work has on numerous occasions made its way into Alicia’s quilts. The pair volunteered with the U.S. Forest Service on the Oregon coast for seven years before moving back to Arizona and settling in the Phoenix suburb of Surprise. Click the YouTube box and adjust settings to see the video in HD 1080P at full screen. Challenges are a common thread in the quilting organization world, designed to expand the skills of the participants. A plan of some sort is laid out over time, sometimes abstract, sometimes specific. Sterna’s challenges have started out at times with a photo, or a page from a magazine, and taken unexpected twists to produce unpredictable but individual results. While she and Randy were in Lakeside, Arizona last summer the Wallow Fire broke out, and every day she saw the smoke billowing above the burning forest. 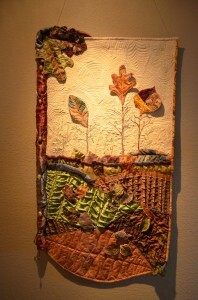 It became the inspiration for the quilt she submitted to the Hoffman Fabric Challenge competition. She and Randy went hiking through the burned forest afterward and he shot photos of the charred wood, later superimposing a photo of a lily over the top as a symbol of rebirth from the ashes. “I took the blue background of the sky and decided to feature the pyrocumulus cloud that rose every day right behind where we lived, over the lake,” she recalls. “It was an incredibly impressive, dynamic cloud. I used various black fabrics to make charred trees and I cut them out and formed them all coming toward the cloud like you were looking up from the bottom.” Paint, colored threads and a variety of fabrics and techniques added to the creation of the powerful final image. Quilting is a form of relaxation for Sterna, a way of dealing with the stresses and emotions of life and of turning those feelings into tangible and beautiful works of art. The walls of her home are a display of her work, changed up periodically to continue to be inspired by the best she’s done so far. 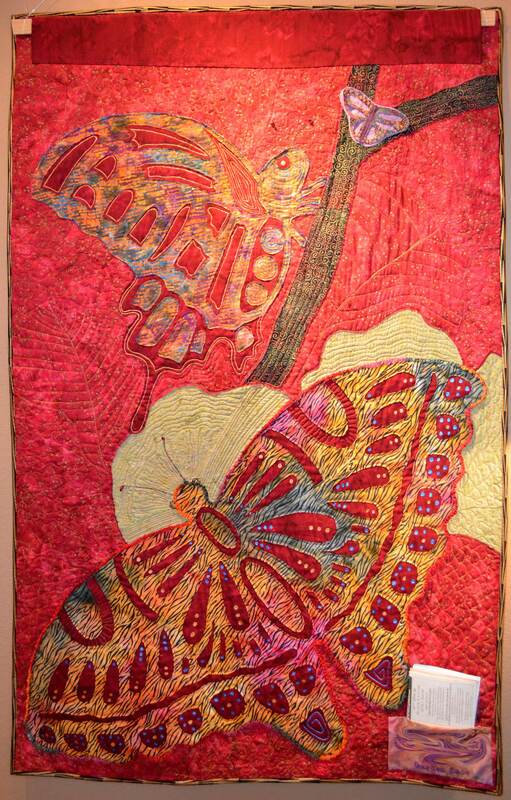 Like many in the quilting community, she has donated her quilts to various charities, including women suffering from breast cancer. 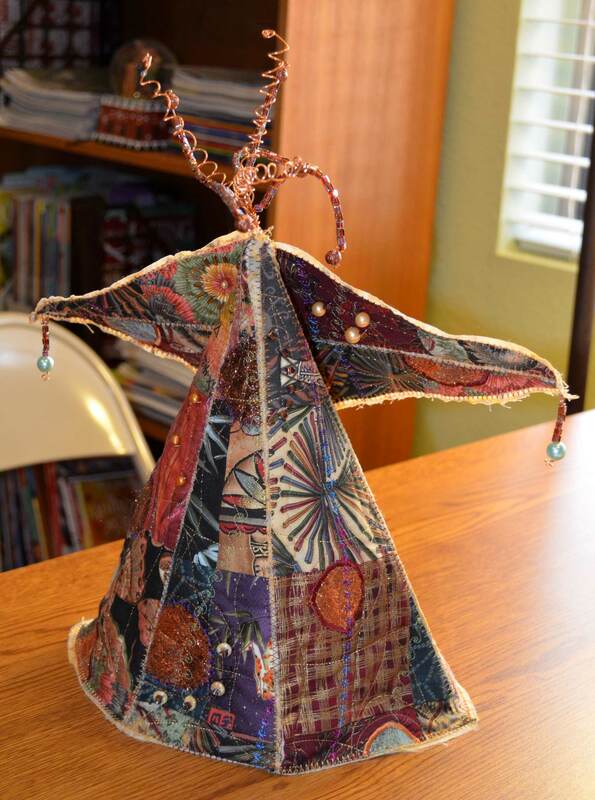 She’s published one book, Fabric Art, and likely has more ahead. In talking with Sterna one gets the impression that she loves what she does as much for the process as the final product. There’s the thrill of putting an image together in her mind, finding the fabrics and techniques that will realize that vision, and reveling in the sheer surprise of seeing how it all eventually comes together. She is on a journey in fabric, leaving a trail of visual gems behind as she walks the path. PS: Trying to squeeze a portrait of Alicia Sterna’s work into a five-minute video is like shooting a photo of a street corner in Idaho and saying that it’s a photo of the earth. “Wallow Fire” photo courtesy of Randy Sterna, all other by Daniel Buckley. ~ by Daniel Buckley on February 3, 2012. You did a marvelous job on this video, and of representing me and my work to the viewers. This piece is a wonderful summary for me of thoughts and history of the work I do. I hope it is inspriational to other quilters and helps those who are seeing their first art quilts to appreciate the medium as an art form. Thank you for including me in this aspect of the Centennial Exhibit. I am eager to see the entire exhibit later this month. Alicia Sterna is quite the inspiration. Thank you for the additional interview with her and opportunity to learn more about her process. 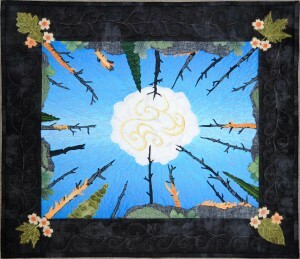 We are lucky enough to have a gift of a quilt made by Alicia. We took a trip to Australia and New Zealand a few years ago and one of the stops was in Alice Springs, Australia. We visited the famous Red Mountain referred to as Uluru by the natives. A few months after returning home, she presented us a quilt featuring Uluru. It is framed and hangs in our dining room.